Holidays in Riviera Maya promise sun soaked, picture perfect beaches which stretch out for almost 20 miles along Mexico’s Yucatan Peninsula. This Caribbean coastline is ideal for couples and families looking to enjoy relaxation by the beach, world class coral reefs and beautiful eco parks. In fact, the world’s second largest coral reef is waiting to be explored just offshore, where you’ll find colourful corals, rays and sea turtles. Don’t forget to visit some of the ancient ruins that Mexico is famous for, such as the iconic Chichen Itza, which is the largest archaeological city of the Mayan civilisation. The eco park Xcaret offers family friendly fun such as zip lining through jungle canopies, river tubing and snorkelling, while Playa del Carmen, one of the trendiest towns on the Riviera Maya, is perfect for those looking for chic bars and restaurants. Head to 5th Avenue to find a variety of boutiques and markets, or practice your swing at El Camaleon Mayakoba Golf Club, which boasts a fantastic course surrounded by a mangrove forest, jungle and the ocean. A luxury holiday in Riviera Maya treats its guests to stunning Caribbean scenery, upmarket restaurants and gorgeous beachfront hotels. Spend your days relaxing by the ocean with a mojito before heading to Playa del Carmen for an evening meal; discover the oceans by diving in the world class reefs, or enjoy the natural scenery at one of the many eco parks here. 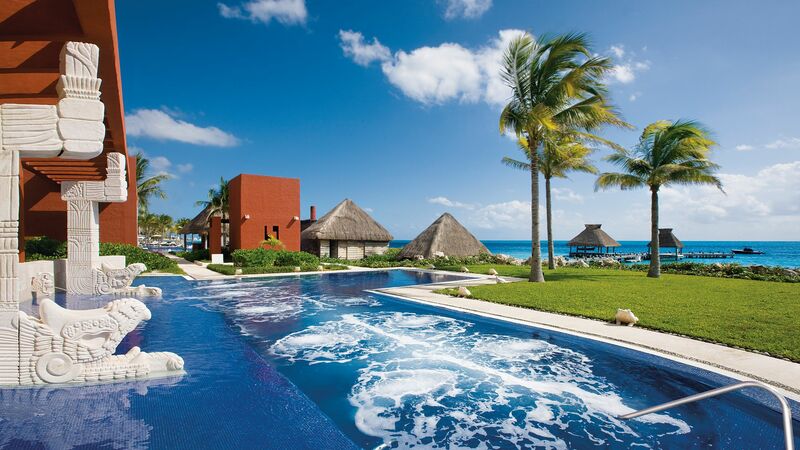 There are a range of luxury hotels in Riviera Maya, and Sovereign offers some excellent choices. Grand Velas All Suites Resort & Spa is located just minutes from Playa Del Carmen, so guests will be treated to the perfect Caribbean coastline right on their doorstep. The hotel also boasts an award winning spa, gourmet dining and a personal concierge service. The Zoetry Paraiso De La Bonita offers a huge Thalassotherapy spa, a gorgeous beachside grill and a range of activities such as tequila tasting and yoga. For your sightseeing fix, the Riviera Maya is home to Coba, an ancient Mayan city that features the largest network of stone causeways in Mayan history. This fascinating site is believed to date back to 50 BC, and features a towering pyramid with 130 steps – if you’re feeling brave, you can scramble up to the top for incredible jungle views. The tiny island of Cozumel is adrift off the coast of the Riviera Maya. Perfect day trip material, the island offers superb snorkelling and scuba diving, and is renowned for its natural beauty: it's thick with mangrove forests and edged with gleaming white beaches. On a cliff top overlooking the Caribbean Sea is the archaeological site of Tulum. The remains of this Mayan walled city include incredible stone temples and walkways at around 40 metres above sea level, with spectacular views of the coast. Once you’ve finished exploring, head into bohemian Tulum town – it’s one of Mexico’s most fashionable destinations, with top-rated restaurants and rustic-chic beach bars. Flight time from the UK is around 11 hours. Transfer time from Cancun airport to the Riviera Maya is approximately 35 minutes. 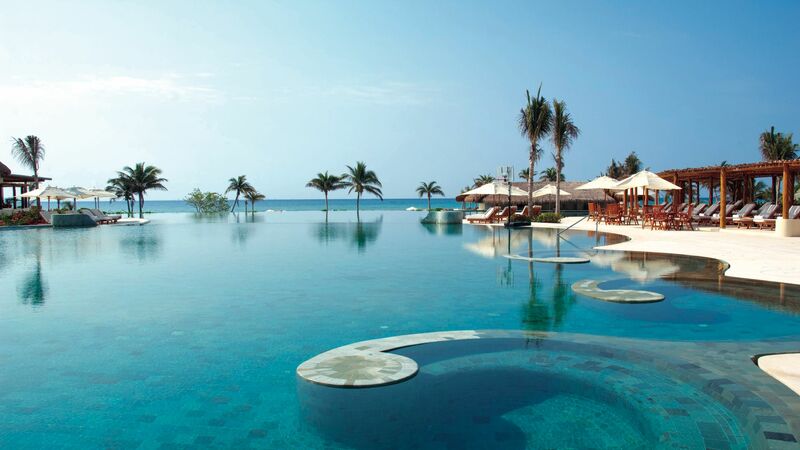 Mexico is a year-round beach destination, with temperatures rarely dipping below 20°C – even in winter. The summer months are at their hottest between May and September, which have average temperatures of 28°C. While short rain showers are possible, they are helpful in taking the edge off the heat. UK citizens travelling to Mexico do not currently require a visa. You will need to fill out a tourist card, which you will be provided with on arrival. Mexico has a tipping etiquette similar to the USA. Service employees typically receive little or no base salary, so tips make up the bulk of their salary. Try to tip about 15% of the bill in restaurants and bars unless the bill includes propina (gratuity). Taxi drivers do not usually get tipped unless they have provided an extra service like loading or unloading your bags. The official language of Mexico is Spanish. English is widely spoken too, so getting by is easy. What is the best way to get around Riviera Maya? Hiring a car is easy and allows you to take advantage of the new roads in the area. Taxis are plentiful, but agree a price before setting off. White mini-vans known as Colectivos ferry groups of locals and tourists around for less than a taxi. Two bus companies also operate in the area.